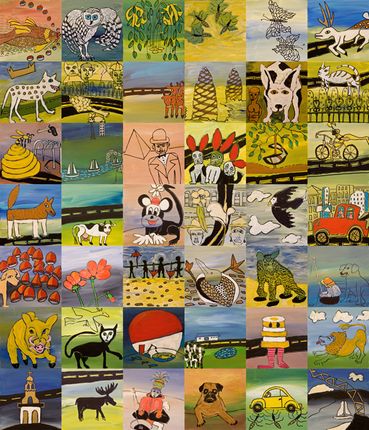 "Bits & Pieces: A Visual Journey"
In 2010, Christa Lawler interviewed Adu about the show she was preparing at that time for the Duluth Art Institute, consisting of hundreds of 12" x 12" square canvas paintings. "One of Adu Gindy's muses is the highway system. "The painter watches the world through the car window, then goes to her studio to re-create the story of the things she has seen, and the green, blue and mustard-hued fields—horizontal swatches of color that are the pauses between thoughts and the passing of time. "Gindy's exhibition 'Bits & Pieces: A Visual Journey' is in the John Steffl Gallery at the Duluth Art Institute, and it includes about 200 pieces she has painted in the past year—many of those while on the road."